This article explores how the eastward expansion of the European Union (EU) affects the lives and identities of youth in Belgrade, Serbia, a post-socialist, post-conflict, non-EU country. This study involved qualitative interviews with 17 participants (university students) aged 20 to 30, a generation that grew up during the 1990s when the Yugoslav secession wars left Serbia isolated from western Europe politically and economically. I explore how urban, educated, Serbian youth mark themselves as European relative to other segments of Serbian society and through this positioning disassociate themselves from responsibility for the violence and instability of the 1990s. Using the lens of abnormalcy discourse in post-conflict and post-socialist settings, I also consider the tension between belonging and exclusion that marks the experience of growing up in the shadow of the 1990s. The borders of the European Union (EU) have been extending east for the last decade, and an ever-smaller number of countries in Europe now find themselves on the periphery of this border. While most of the focus on European integration has been about the elimination of borders between nations and the building of a united Europe, the other side of this process has been the securing of borders outside the EU and the creation of new borderlands within Europe (Szmagalska-Follis 2009; Virkunnen 2001). More recently, these spaces on the EU’s “immediate outside” (Jansen 2009:819) have been receiving more academic attention, as the expanding EU border regime is seen to affect the everyday experiences and identities of non-EU citizens (Greenberg 2010; Jansen 2009; Szmagalska-Follis 2009). This article has been adapted from my master’s thesis and is based on my graduate ethnographic fieldwork in Belgrade, the capital city of Serbia, an EU candidate state. Conducted over a six-week period in April and May 2013, this research involved qualitative interviews conducted in the Serbian language with university students aged 20 to 30. In the first part of this article, I position Serbia as a non-EU state in Europe in the context of recent history, namely Serbia’s role as aggressor in the Yugoslav secession wars of the 1990s. The “1990s” have become shorthand for describing a decade marked by then-President Milošević’s ultra-nationalist politics that ravaged Serbia’s economy, infrastructure, and political relationships. I argue that for participants of this study, the prospect of eu membership symbolizes a move away from Serbia’s violent past, and fulfills a desire to be included in the cultural space of Europe after growing up in relative isolation. I explore how urban, educated, Serbian youth mark themselves as European relative to other segments of Serbian society and through this positioning disassociate themselves from responsibility for the violence and instability of the 1990s. In the second part of this article, I offer an analysis of participants’ use of abnormalcy discourse regarding everyday life in Belgrade in order to demonstrate how the legacy of the 1990s continues to affect the subjectivities of Serbian youth in the context of eu expansion. Depictions of Serbia as irreparably abnormal and corrupt after the 1990s are constructed in contrast to an idealized image of life in EU countries. I argue that through abnormalcy discourse, Serbian youth express a tension between European belonging and exclusion that marks the experience of growing up in the shadow of the 1990s. In focusing on post-socialist youth, this article follows the lead of insightful anthropological research about how the ‘normal life’ is imagined and defined by young people in the context of democratization (Fehérváry 2002; Galbraith 2003; Greenberg 2011). In Serbia, youth perspectives on European integration deserve particular attention because young people are growing up in the legacy of the 1990s and possess a unique perspective on this decade having experienced it as children. While membership in the EU remains a distant goal in Serbia, it has dominated political discussion since the overthrow of President Milošević in 2000, and has been tied to ideas about Serbia reinventing itself politically, socially, and economically (Greenberg 2010, 2011; Subotić 2011). For Serbian youth who have grown up in this political climate, the question of EU integration seems to form the backdrop against which contemporary imaginings of Serbia are formed, articulated, and contested. Fourteen years after the overthrow of Milošević, it is important to explore not only what it might mean to join the EU, but also the practical and symbolic implications of what it means to be on the outside. My interest in this topic is not purely academic, since I was born in Belgrade and moved away in the early 1990s. In addition to being Serbian, I shared numerous traits with interview participants which made me something of an insider: age, class-position, urban identity (although not a proper ‘Beograđanka’), and university student. Taken together, I feel our shared traits helped relieve me of the position of “judging westerner” (Greenberg 2010:44) experienced by other researchers in the area. Participants generally assumed I was “on their side,” and that I would write a flattering report. However, although I was not considered “judging,” I was definitely considered a westerner. Participants tended to view me as rich, well-travelled, “on vacation” in Belgrade, and a citizen of a “normal,” “well-functioning,” and “orderly” country — if not utopia. Statements about how things do not function properly in Serbia were often compared explicitly with how the participant imagined my life in the West. Their wild imaginations about life in Canada (where there is no poverty or homelessness, and everybody lives in spacious downtown apartments and works fulfilling jobs) drove home a major point of inequality between me and the participants: I had visited their country often, but they had never visited mine, and maybe never would. As Jansen points out regarding his fieldwork in Sarajevo, I was there by choice and could leave anytime, while participants had a much more complicated relationship with crossing the border (2009:815). In order to understand Serbia’s position outside the EU and the dynamics of inclusion and exclusion inherent in EU expansion processes, it is necessary to contextualize the country’s EU aspirations in the context of its recent history. Serbia’s relationship to the EU can be best understood by examining it as a post-war and post-socialist state. In the early 1990s when newly independent eastern European states were applying for EU membership, Yugoslavia was embroiled in a violent civil war. The “enormous country, all the way from Slovenia to Macedonia,” as one research participant described it, had begun to unravel after the death of socialist leader Tito in 1980, and throughout the rise of ultra-nationalist authoritarian president Slobodan Milošević in the late 1980s. Tito’s Yugoslavia was a key member of the Non-Aligned Movement during the Cold War. During this period, Yugoslavs proudly differentiated themselves from Eastern European states behind the Iron Curtain, since their softer version of socialism allowed them to enjoy relative freedom of travel and a decent relationship with Western European states (Todorova 1997; Ugrešić 1992). These “better days of Yugoslavia” (Todorova 1997:53) were a time of relative economic stability and peace between the six Yugoslav republics, as Tito enforced the politics of “weak Serbia – strong Yugoslavia” (Crnobrnja 1996:107) that held the country together. This period sits in sharp contrast to the period of that followed Tito’s death, when nationalist sentiments grew across the country. As each Yugoslav republic, with the exception of Montenegro, declared its independence, Milošević’s nationalist politics (coupled with those of Croatian president Franjo Tuđman) brought Serbia, Croatia, and Bosnia-Hercegovina into a 1991 to 1995 civil war characterized by war-crimes, ethnic cleansing, massive refugee flows, and genocide. The United Nations (UN) and the EU responded to the war by imposing economic sanctions, arms embargoes, and visa restrictions. While the war was fought outside of Belgrade by both paramilitary troops and the Yugoslav National Army (JNA), the city was hurt by the lasting effects of the war: economic sanctions, capital flight, hyper-inflation, visa restrictions, Mafia-style corruption, and nationalist propaganda. In addition, Milošević’s privatization policies in the early 1990s exacerbated the situation by creating high unemployment and putting money into the hands of a wealthy few (Gould and Sickner 2008). In 1999, the autonomous Serbian province of Kosovo declared its independence, which resulted in another war lead by Milošević . The United States intervened through the North Atlantic Treaty Organization (NATO) bombing of Belgrade, and further sanctions were placed on Serbia by the international community. Western media accounts supported by academic explanations of the wars depicted the Balkans as primitive, backwards, anti-Western, and non-European. Todorova shows how such a depiction taps into a long history of Balkanist discourse, characterized most notably by “the externalization of evil on an abstract Balkanness” (1997:47). Through this discourse, which is explored in the section below, the Balkans are constructed as the other of Europe, and western Europe constructs its own superior image by opposition. In a relatively short time, Belgrade went from being the capital of an internationally respected Yugoslavia to the capital of a war-torn pariah state. This dramatic shift in geopolitical position is manifest in the popular nostalgia toward the ‘red passport’ of Tito’s Yugoslavia, as it represents freedom of mobility and, by extension, certification of inclusion in the European community that the subsequent Serbian passport did not provide (Jansen 2009). EU visa restrictions placed on Serbia during the 1990s were kept in place until 2009, which further contributed to a sense of isolation within Europe (Greenberg 2010; Jansen 2009). After the 1999 NATO bombing, public support for Milošević dropped dramatically, and in October 2000 he was overthrown and replaced with a coalition government. This marked a democratic turn in Serbian politics, and there was widespread optimism that Serbia would soon join the EU. However, the 2000s did not bring the quick accession people hoped for. Rather, it was a time of highly divisive politics between Western reformists, ultra-nationalists, and numerous others. Even with Milošević out of power, the legacy of the 1990s spread into the next decade in the form of a weakened economy, brain drain, compromised freedom of press, and corruption at every level of government (Stojić 2006). Contemporary Serbian politics are still focused on a recovery from this decade, especially as Serbian EU accession hinges on certain additional conditions related to its role as aggressor in the Yugoslav wars. The most notable condition has been Serbia’s cooperation with the largely unpopular International Criminal Tribunal for the Former Yugoslavia (ICTY) through the extradition of war criminals, most of whom were high-ranking political figures in Milošević’s regime. Recognition of Kosovo’s independence is also widely perceived as an additional condition for EU membership, and this issue takes centre stage in right-wing anti-EU political campaigns asking voters to choose between Europe and Kosovo. Taken together, these issues contribute to a relatively high domestic opposition to Serbian EU integration. 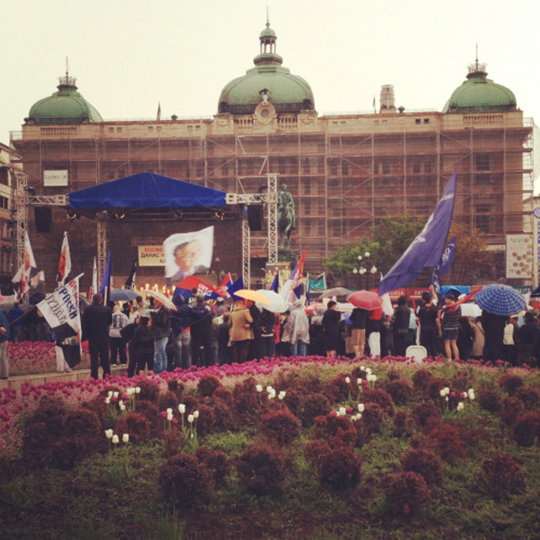 In 2012, when Serbia received official candidate status, opposition to joining the EU had climbed to 47 per cent of the surveyed population (Papović and Pejović 2012). Contextualizing Serbia as a post-war, post-socialist, and even post-Yugoslav state is necessary for exploring the topic of EU integration for a number of reasons. First, it helps to clarify certain practical reasons why Serbia’s EU aspirations have been difficult to achieve. Most notable are the economic setbacks of consecutive wars and the additional EU membership conditions. Second, the imposed economic isolation of the 1990s and the 1999 NATO bombing of Belgrade are important for understanding Serbia’s complicated and sometimes hostile relationship with Western European states and institutions, even as it works toward EU membership. And most importantly, understanding Serbia’s current position outside the EU in the context of recent history is important because of the ongoing legacies of this history, both the “better days of Yugoslavia” (Todorova 1997:53) and its disintegration. This history informs understandings of Serbia’s geopolitical and symbolic position in Europe, which is crucial for understanding what it means to be Serbian, Balkan, or European. The relationship between these dynamic categories constitutes a “hierarchy of multiple identities” (Todorova 1997:44) that is further complicated by the eastward expansion of the eu and the creation of new borderlands of inclusion and exclusion created by this process (Szmagalska-Follis 2009). As an eastern European and Balkan country, Serbia occupies a space that has been theorized as peripheral and subordinate to western Europe, an ambiguous zone of cultural and economic exclusion separating western Europe from Asia (Todorova 1997; Wolff 1995). Analyzing the long-standing symbolic power of western Europe to stand for modernity, civilization, and progress, Todorova and Wolff demonstrate how through demi-orientalist and Balkanist discourse, western Europe constructs itself as Europe ‘proper’ while constructing eastern European and especially Balkan countries as the other of Europe. As Wolff describes it, eastern Europe is “within Europe but not fully European” (1995:9; see also Said 1979). The unique position of the Balkans in Europe is often expressed poetically through the metaphor of bridge or crossroads: a state of permanent ambiguity and transition with one border to the east and one border to the west. Todorova writes that what is “disquieting” (1997:58) about this metaphor — apart from the premise that east and west are fundamentally and essentially opposed — is the perception that life on the bridge is abnormal, a stigma, “an intolerable state of existence” (58). The discursive equation of western Europe with Europe ‘proper’ that Todorova and Wolff discuss has a parallel in the contemporary equation of the EU with Europe in both academic and political discourse. For example, Serbia’s EU aspirations are being hailed as the country’s “return to Europe” (Lindstrom 2003:313) after the isolation and violence of the 1990s. 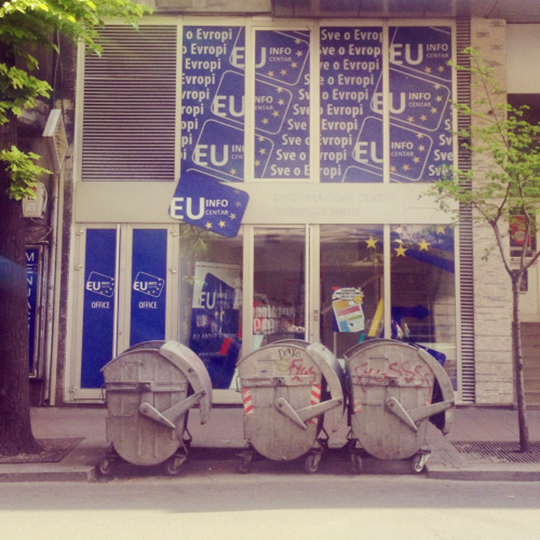 In Serbia, this framing is evident in pro-EU political slogans such as “Idemo u Evropu!” [Let’s go to Europe! ], which problematically positions Serbia as literally outside of Europe, aspiring to get in. As these examples suggest, ‘Europe’ is not a static category defined by geography, but a culturally contested space, a shifting border that always includes some and excludes others. To be a non-EU country in Europe is therefore to occupy a peripheral position in the symbolic hierarchies of Europe in a way that mirrors the historical othering of Balkan and eastern European countries. In the case of Serbia, European integration is framed as a move away from the backwardness and isolation of the Balkans and towards an idea of Europe as embodied by the eu: a cultural space symbolizing modernity, progress, and interdependence (Noutcheva 2009; Renner and Trauner 2009; Vachudova 2005). Academic explanations of Serbia’s difficulties in meeting eu accession requirements have pointed to its irreconcilably ‘Balkan’ identity and the supposed dichotomy between the Balkans and Europe (Ekiert, Kubik and Vachudova 2007; Lindstrom 2003; Subotić 2011). As the eu has expanded eastward, it has encompassed states such as Poland or Hungary that were historically considered ‘eastern,’ as well as states that have historically been labeled ‘Balkan,’ such as Bulgaria and Romania. The eastward expansion of the EU therefore blurs and complicates the long-standing imagined hierarchies of Europe and suggests a new symbolic hierarchy between EU states and non-EU states. For example, writing about the inclusion of Poland in the EU and the securing of the Poland-Ukraine border, Szmagalska-Follis uses the concept of “new borderlands” (2009:397) to explore how Poland’s EU accession affected Ukrainian people’s identities and everyday experiences, especially considering that Ukrainians had previously enjoyed visa-free travel to Poland. As the hierarchies of Europe shift in relation with EU mobility and economic privileges, new borderlands are created between EU states and non-EU states that are characterized by a tense interplay between proximity and distance, affecting experiences and identities on an everyday level (Szmagalska-Follis 2009). For this reason, the experience of living in a non-EU state in Europe has been theorized as being a very marginalizing experience (Jansen 2009; Szmagalska-Follis 2009). Writing about Serbia, Jansen argues that being on the outside of the EU is characterized by feelings of isolation and resentment, emotions which reveal a fear of not being recognized by others as having a “place in the world,” (2009:824) and a fear of being excluded to the point of literally “falling off” of the world. Where are we, then? In Australia? Floating in the middle of the Pacific? It bothers me because it’s nonsense. Europe! Europe! — that’s not Europe. But people here talk like that quite often: ‘We are going to Europe.’ It’s not Europe! You are going to the European Union. You are going to join a partnership. You are going to join a firm, basically. In this excerpt, Ivan takes issue with the equation of the EU with Europe because it introduces a set of symbolic, economic, or cultural criteria for inclusion that redefines who counts as ‘European’ in non-geographic terms, and in doing so excludes Serbia. Ivan compares the feeling of exclusion to being outcast “in the middle of the Pacific,” a metaphor which echoes Jansen’s (2009) argument that not having a place in the world amounts to a fear of literally falling off of the world. Ivan’s comments are effective in demonstrating how EU values and accession criteria are coming to define what being ‘European’ means in everyday speech in Belgrade. Echoing Wolff’s description of eastern Europe as “within Europe but not fully European” (1995:9), to be outside of the EU means to be perceived as not being truly or fully European. In the following section, I explore how participants of this study stake claims to Europeanness through the markers of youth and urbanity. In exploring how self-identification as ‘European’ is meaningful to this group, it is important to remember that identity categories are dynamic, and to delve into a deeper understanding of what the marker ‘European’ means to this particular group at this particular time. Not only is the outside of the EU growing smaller as other Balkan or eastern European states are admitted into the EU, but youth in Serbia have grown up during a period of economic and physical isolation from the EU and from the West more generally, which affects how they perceive their relationship to the rest of Europe. For this reason, it is important to remember that these claims to Europeanness are made in the context of the EU’s expansion into eastern Europe and Serbia’s exclusion to date from this process. Insightful qualitative research has pointed to the disconnect between how history is interpreted by youth who grew up in a post-war or post-socialist setting and how it is interpreted by older generations who lived through or directly experienced this history (Schwenkel 2011; Shore 2009; Marada 2007). Marada (2007) has argued that the end of communism was an event that intensified if not constituted a generational cleavage between those who experienced it directly and those who experienced it second-hand. Similarly, Shore has argued that “a few years suddenly mattered very much” (2009:110) in shaping youth perspectives or understandings of intense historical events and changes such as the end of communism. Serbian youth have been singled out as a unique ‘war generation’ by studies in various fields including sociology, anthropology, psychology, policy studies, and even literature, since they grew up in the 1990s, a period sometimes characterized as a moral vacuum without role models to look up to in the public sphere (Greenberg 2011:94). According to Greenberg, a defining aspect of this generation is that it tends to distance itself from responsibility for the violence and instability of the 1990s, since its members were too young to be involved in political decision-making processes (2011:96). In a similar vein, in her research on generational cleavages after the communist regime in Czechoslovakia and Poland, Shore argues that age affects who is perceived as “old enough to be held responsible” (2009:327) for harmful communist legacies. She further argues that youth who had no direct memories of the communist regime tended to discuss its negative qualities with an unfounded sense of self-confidence that they or their generation would not have made the same moral compromises as the previous generations had. Consistent with Greenberg (2011) and Shore (2009), I found that young people in Serbia tended to make use of their youth to mark themselves as separate from 1990s era politics since they were too young to experience the hardships of the 1990s in a meaningful way. Several participants informed me that their parents succeeded in making them feel “guarded” from the realities of war by struggling to give them a “normal life” despite the chaos that prevailed. They therefore remembered the 1990s differently or less seriously than their parents’ generation. I found that the tendency among youth to separate themselves from 1990s era politics also translated into a lack of responsibility toward contemporary political outcomes and events that are connected to the legacy of the 1990s. This is important to consider since Serbian EU accession politics are still focused on making a recovery from this period. For example, most participants attributed Serbia’s slow-moving EU aspirations to the additional and specific accession membership conditions related to Serbia’s role in the Yugoslav wars. By assigning Serbia’s political problems and the responsibility for their resolution strictly to their parents’ generation, participants were able to position themselves as rightfully belonging to Europe regardless of Serbia’s inability to meet EU accession conditions. I feel bad that I will most likely be one of those people who leave, but I really don’t plan to spend the next 10 years waiting for Godot, for something to change — and then to end up sounding like my dad when I’m 50, living in the past. I mean, not so much anymore. He really is much better now. But for a time he really spoke about how things were better before and nothing is worthwhile anymore. And I don’t want to be like that. To be that kind of old person, unhappy and bitter, only complaining about how pensions never come … Honestly, I hope that one day I will come back and be part of a Serbia that is prospering, not a Serbia that is stagnating. In saying that she hopes to “come back and be part of a Serbia that is prospering,” Milica suggests that Serbia’s perceived stagnation is not her or her generation’s problem to resolve. She brings up her father’s complaint that “things were better before and nothing is worthwhile anymore,” which implies that the deteriorated or stagnant situation in Serbia became a problem in her father’s time, and she was merely born into it. By making the decision to relocate to the EU, Milica positions herself as belonging in Europe despite Serbia’s geopolitical position outside the EU. She reconciles the tension between where she is and where she sees herself as belonging by referring to the phenomenon of brain drain, thereby aligning herself with a critical mass of people who have left before her and who will leave after her. My dad’s a little, you know … bitter. And if you mention, I don’t know, Americans or something to him, he goes crazy. He’s very sensitive about those things: the war in Croatia, the bombings, the 1990s. I mean, if you mention Milošević — pfft! You’ll be hearing about it for the next half hour, how he ruined everyone’s lives. So, ever since I’m living on my own, I talk about that stuff [the topic of Serbian EU integration] way less. Maybe I should be more interested, but to be honest, I’m not terribly interested. I mean … I know a bit. I know that Croatia’s going to get into the EU in a couple months now, right? In July or something? In this excerpt, Bojana makes a connection between her disinterest in Serbian EU integration politics and her father’s excessive stories about the 1990s. While she separates herself somewhat from the 1990s by referring only to her father’s experiences as opposed to her own, it is clear that her disinterest in contemporary politics stems not from being too far removed from the 1990s by her young age, but from a rather intimate knowledge of the 1990s gained through her father. I was probably too young then to look at it that way, so it wasn’t too bad for me. I mean, it wasn’t exactly ideal — I remember that you would go to the store and there’s just nothing, and that my father baked bread because you would go to the store and they don’t have bread, or there’s like a 30 kilometre line-up outside the store. I was saying to my sister — where did we buy make up before Lilly opened up? And I was thinking about it, and then it hit me — at the flea market! And really, I’m not kidding, we would go to the flea market! They’d bring things in from Macedonia … And I guess you just kind of forget about those kinds of things, and so to me growing up here wasn’t something traumatic. Born in 1989, Dragana positions herself as “too young” to have experienced the 1990s in a “traumatic” way. It seems from her account of her father baking bread that her knowledge about her family’s experience of struggle is informed less by the personal memory of, for example, the difficulty of buying groceries, and more from stories her family has told her about the hardships they experienced during this time. Although she distances herself from the 1990s through her age, (“I was probably too young, … it wasn’t too bad for me”), nevertheless, she points out that things she would find absurd now (like buying make up at a flea market full of Macedonian imports instead of a western-style cosmetic shop) are things she actually experienced but “kind of forgot about” since she experienced them as a child. In this way, a forgotten memory of the 1990s influences her understanding of everyday life, in this case delineating where it is normal or reasonable to buy make-up. Through this rather mundane example, we can see a similar situation to the apparent disconnect shown by Schwenkel’s (2011) Vietnamese youth: the participants’ tendency to push the 1990s further into the past comes not from apathy or ambivalence towards this time, but from an intimate knowledge of it that continues to influence their everyday understandings and ideas about their futures. The alternative [to joining the EU] would be … I don’t know, for us to continue to fall apart. Because that’s all I knew growing up: that Serbia is slowly becoming smaller and smaller, that they’re always taking some regions off of us, and that it’s only going to continue to, how would I say this, to fall apart. Although Anica stated elsewhere in our interview that she considers herself to be “part of Europe,” Serbia’s lack of progress towards EU integration lags behind her self-understanding or self-positioning as European. Like other participants who joked about “a return to the 1990s” if Serbia does not join the EU, I would suggest that the participants’ memories and understandings of the 1990s strongly inform how they currently understand the marker ‘European.’ In pinning together the threat of the 1990s and the threat of exclusion from the EU, they are evoking an idea of ‘Europe’ or what it means to be ‘European’ that is constructed in contrast to their ideas about 1990s Serbia. Being “part of Europe” is therefore expressed by separating oneself from this era through markers such as youth: being connected rather than isolated, shopping at modern stores like Lilly rather than make-shift flea markets, and moving forward in time rather than “living in the past” or “stagnating” along with their parents’ generation or those “old enough to be held responsible” (Shore 2009:327). Simply put, being ‘European’ can be read as being included in “the European story,” and no longer being associated with the chaos of the 1990s through a never-ending list of EU accession conditions. Most of the project participants were born and raised in Belgrade and were self-identified urbanites. Belgrade is a lively city with no shortage of cafes, bars, patios, and nightclubs, the best of which are tucked away into unmarked apartments, inner courtyards, abandoned factory buildings, or behind decrepit fences near the train tracks. There is a sense of chaos to the city: foreigners often point out that while the street signs are in Cyrillic, all tourist street-maps are in Latin script, and many of the colloquial names of streets are actually old names from the socialist era (such as Revolution Boulevard) that have been officially re-named on maps and street signs, but never fully adopted by city-dwellers. With a population of approximately 1.3 million, Belgrade is the largest city in Serbia. Novi Sad, the second largest city, has a population of only 260,000. As a city, Belgrade bears both the legacy of the 1990s, during which time it was the capital of an aggressive and war torn pariah state, as well as the legacy of the Post-WWII socialist period, during which time it was the capital of an internationally respected Yugoslavia. Jansen’s research has found that in the context of EU expansion and Serbia’s current peripheral position in the hierarchies of Europe, urban Serbian citizens experience Belgrade’s rapid decline as a fall (or push) from grace (2009:826). There are so many villagers [seljaci] here! It’s not just on the edge of the city — it’s downtown! I mean, just the worst of the worst. I see them on the street, but you know how it is, when you run in a different circle, you don’t really interact. Born and raised in Belgrade, Bojana jokingly told me that she was an “urban snob” and could intuitively tell the difference between a true Beograđanin/ka and someone who was from “the interior.” I asked if it was a matter of dialect or fashion and she explained to me that it was a more intuitive feeling, a sort of urban radar. I found that participants used the marker ‘urban’ to not only distinguish themselves from the city-dwelling seljaci, but also to position themselves or their demographic as belonging in the cultural space of Europe. This generally occurred in one of two ways: Either, the participant would attribute Belgrade with particularly European qualities, for example saying something like, “We have made a lot of progress, and we are a much more European city than any other city in Serbia.” Alternately, the participant would deny European qualities to rural parts of Serbia, as evidenced in the following statement: “There’s a lot of history here, and in that sense it’s something of a — I don’t know how to say this — a European city. It’s not like you arrived in some village.” By describing urban Belgrade as a “European city” as opposed to “some village,” the city and the urban-identified are lifted into the contested space of Europe while the countryside remains on the periphery. The association of urbanity with Europeanness closely mirrors demi-orientalist (Wolff 1995) or Balkanist (Todorova 1997) discourse in which ‘Europe proper’ is characterized as progressive and civilized in contrast to the barbarianism and backwardness of the other. For example, Jansen argues that self-identifying as ‘urban’ in Belgrade involves painting a picture of oneself as cultured, educated, refined, and civilized in contrast to the ‘backwards’ rural peasant (2005:154). He argues that the influx of seljaci into the city is therefore perceived as an encroachment or even an “attack” (160) on urban cultural values, especially by older generations who grew up with the political ideal of “modernization as urbanization” (162) that marked the Post-WWII Titoist regime. Jansen’s (2005) discussion of the rural ‘threat’ to urban modernization in Belgrade is also based on the perceived association between rural influxes into the city and the threat of regression to 1990s-style nationalism, isolation, and backwardness. Ramet has argued that the rise of ultra-nationalism in Serbia was “a profoundly rural phenomenon” (1996:76) that relied on support from rural citizens. Although she was writing in 1996, four years before the overthrow of Milošević, Ramet points out that the rise of the ultra-nationalist movement constituted a “victory of the countryside over the city” (76), while the anti-nationalist, anti-war, and anti-Milošević opposition during this period came largely from Belgrade. Based on the association between 1990s nationalism and rurality, Jansen argues that urban self-identification in Belgrade is taking place within a wider discourse of “mourning for urban, European modernization” (2005:160), or nostalgia for the ‘what might have been’ if the 1990s had happened differently. He suggests that through negative descriptions of seljaci living in Belgrade, urbanites describe the city as being threatened by rurality to relapse to the 1990s. Too much immigration has happened in Belgrade in the last 20 years. Belgrade is no longer the European metropolis it used to be. And that’s ok, you know? I mean, 2 million people live in Belgrade, and how many live in all of Serbia — 6 million? 7 million? So the majority of Serbia is Belgrade. Looking at it proportionally, it’s just not possible for everyone in Belgrade to be urban and cool and critical and progressive and all that. Goran distinguishes himself and his peers as ‘truly’ urban (“and cool and critical and progressive”) as opposed to the non-urban city dwellers. Although Goran is fine with the fact that not everyone in Belgrade is urban, his view that “the majority of Serbia is Belgrade” suggests that he does not want to consider the rest of the country beyond Belgrade, which for him is certainly not cool or critical or progressive. If we transpose the concept of deterritorialized urbanity to the idea of vying for space in the symbolic geography of Europe, the use of urbanity as a signal for Europeanness can be read as a way for participants to position themselves as ‘truly’ European in relation to other (rural) Serbian citizens. I found it interesting that numerous participants echoed Goran’s perception that “Serbia is Belgrade,” not only in terms of population, but also as the centre of government and political decision-making processes. The oft-cited rhyming expression “što južnije, što tužnije” [the further South you go, the sadder it gets] further reinforced for me how participants ranked rural and urban in the Serbian hierarchy. In identifying as genuinely urban, Serbian youth stake claims to Europeanness as a symbolic or cultural designation by distancing themselves from the chaos of the 1990s, insofar as ultra-nationalism is perceived to be a rural phenomenon (Ramet 1996). In terms of Serbian EU integration and the symbolic geography of Europe, positioning urban Belgrade as “progressive” and treating the city as the most meaningful part of the country allows urban youth to raise Belgrade to the status of ‘European’ while leaving the Serbian countryside in the darkness of the Balkans, in that ambiguous zone between Europe and Asia. I have explored how Serbian university students make use of the markers of youth and urbanity to mark themselves or their demographic as belonging within the cultural space of Europe despite Serbia’s geopolitical exclusion from the EU. Through this positioning, they distance themselves from responsibility for the violence and isolation of the 1990s, a tendency which I argue translates into a sense of separation from contemporary political outcomes and events insofar as Serbian politics are still focused on a recovery from the 1990s. In the following section, I explore this tension between Belgrade youth’s sense of belonging in Europe, on one hand, and the geopolitical and symbolic exclusion of Serbia from the EU, on the other, through the lens of abnormalcy discourse in post-socialist and post-conflict settings (Fehérváry 2002; Galbraith 2003; Greenberg 2011). Drawing on Greenberg’s argument that urban youth in Serbia perceive the country to be a “post-disciplinary state” (2011:90), a state that is unable to produce agentive subjects capable of moral action or of making a ‘normal life’ for themselves, I explore how commonplace depictions of life in Belgrade as “abnormal,” “chaotic,” “immoral,” “corrupt,” or “wild” can be understood in the context of EU expansion and Serbia’s position on the margins of European belonging. Anthropological research on everyday life in post-socialist settings has found that discourse about what constitutes a ‘normal’ life is constructed in relation to how people imagine life to be like in the West, and tends toward idealized and exaggerated depictions of the consumerist lifestyle (Fehérváry 2002; Galbraith 2003; Greenberg 2011). Such idealized perceptions of western daily life come to be defined as ‘normal,’ contributing to a dramatic discrepancy between ‘the way things are’ and ‘the way things should be.’ For countries that were behind the Iron Curtain, idealized and exaggerated stories of what life was like in the West reinforced the sentiment that “real life was elsewhere” (Szmagalska-Follis 2009:388), and that life was better, easier, and more fulfilling on the other side of the Curtain. In the context of contemporary Serbia, idealizations about Western consumerist lifestyles stem partially from limited travel experience to the EU, and are further reinforced by pro-EU political platforms and ad campaigns which portray the EU as a “land of milk and honey,” according to several participants. While Fehérváry (2002) and Galbraith (2003) have focused mainly on normalcy discourse as it relates to post-socialist consumer aspirations (in Hungary and Poland respectively), Greenberg (2011) takes an explicitly political focus in her research with urban youth in Serbia. Greenberg’s research shows that perceptions of abnormality in Serbia are inextricably connected to the atmosphere of corruption stemming from the 1990s, as well as the experience of feeling isolated from Europe. Through a focus on abnormalcy, she explores the moral dimension of normalcy discourse. She finds that many young Serbian citizens perceive Serbia to be in a state of crisis, moral chaos, and international isolation in which ‘abnormality’ thrives. She argues that the sense of lacking agency to realize goals regarding a ‘normal’ life was attributed not only to the constraining political and economic conditions characteristic of post-socialism, but also to a sense of moral decay that emerged in the 1990s with the disintegration of value systems and the rise of organized crime and state corruption. In contrast to the experience of Yugoslav citizenship, Greenberg found that young people in Serbia perceive themselves as no longer being ‘normal’ agents capable of effective or moral action in the world due to the “corrupting environment” (94) around them. I’m going to Sweden [to pursue a Master’s degree after graduation] because I want a standard. That’s that. It’s a consequence of Serbia that you get sick of the chaos that rules here, that some people love. Sometimes it’s amusing because that chaos lets you slip through the cracks, but on the other hand, the system doesn’t function, and you’re not protected. You can’t count on anything. And that’s why I want to go to Sweden, because it seems to me that there is a high social standard over there, unlike here. In this excerpt, the abnormalcy of Serbia is constructed in contrast to an image of Sweden (or the EU more generally). Milica expresses frustration of living in a system that “doesn’t function,” and simultaneous a lack of responsibility for “the chaos that rules here,” which may be understood as a reference to the legacy of the 1990s. Through her decision to relocate to Sweden because she is “sick of the chaos,” she attributes Serbia’s state of abnormalcy to the problems of her parents’ generation and positions herself as belonging in a country with a higher social standard. Greenberg’s concept of the “post-disciplinary state” (2011:90) provides a lens through which to think through the tension between abnormalcy discourse among Belgrade youth and their concurrent sense of belonging within the cultural space of Europe. She argues that urban youth in Serbia perceive it to be a post-disciplinary state: a state that is unable to produce subjects capable of either acting morally or making a ‘normal life’ for themselves. Through this concept, she makes a connection between having a sense of agency and being subject to disciplinary regimes of power. She argues young people in Serbia feel that the state does not provide the conditions for them to realize their agentive capacities in a meaningful way. Through talk about wanting a ‘normal life,’ Serbian youth express a desire to be part of “a state that works” (90): a functioning, regulated, and disciplinary state which would give them a moral compass for action. Well, I’ve gotten used to this system of fora in Serbia. How there are no rules. And maybe, if everything were different — but it’s also impossible! — we’d have to reform the judiciary a great deal. You know why it’s impossible? Well, I can go and break all the laws I want, and I can get called into court. And I delay it: I don’t show up to court once; I don’t show up to court twice. I can do this for ten years. I can do this for the rest of my life. That’s the fora in Serbia: you can do anything — but only if you have the nerves for it. Marko’s excerpt shows how growing up in a corrupt system or a post-disciplinary state causes him to “get used to” that system and to perpetuate it despite the fact he might morally disagree with it. He suggests that it is “impossible” to change the system for the better, since the changes that need to be made are on the level of the state (or judiciary) rather than on the level of the everyday. Marko’s comment suggests he does not feel he has agency to act morally in Serbian society, rather he has learned the fora and acquired the “nerves” to go along the system. Until someone concretely tells us that we have to change something, we aren’t going to. We aren’t in a position where we are able to do it ourselves. And that’s what would be good about it [EU integration], for some authority to come and say ‘ok, no more games. No more fooling around. Now you have to apply this and that law.’ And that we have to do it, that someone regulates it. Because otherwise someone’s going to start veering a bit left, a bit right, I’ll just go ahead and change this a tiny bit, get out of this or that. And then in the end it’s chaos. So as far as all that stuff goes, I think it [the EU] would be really good for us. Dragana’s description of Serbian society’s tendency to veer “a bit left, a bit right” until the system is in “chaos” is consistent with numerous participants’ depictions of Belgrade as lawless, corrupt, and chaotic, as well as with Greenberg’s (2011) characterization of the post-disciplinary society, in which people do not feel their state is able to provide them with a moral compass for action. Serbia is depicted as a society where corruption and lawlessness thrive, taking away individual agency or will to follow Serbian laws or to attempt to make progressive changes within the system. This depiction of Serbia is constructed in contrast to an image of the EU as an “authority” with the ability to impose law and order. As new countries are accepted into the EU, the space on the outside of the EU shrinks and the exclusion becomes more evident, theoretically leading to increased resentment among those left outside, as was found by both Szmagalksa-Follis (2009) and Jansen (2009). This is perhaps most poignant in the countries of the Balkans or eastern Europe, since they have long been represented as culturally dichotomous to western Europe (Todorova 1997; Wolff 1995). Based on my limited sample of participants, I think that abnormalcy discourse among Serbian youth reveals a sense of tension between their self-understanding as belonging within the cultural space of Europe, and Serbia’s geopolitical position on the outside of the EU. Given the participants’ sense of separation from responsibility for the 1990s, abnormalcy discourse can be read as a critique (Galbraith 2003) of the legacy of the Milošević regime, or an expression of the ‘what might have been’ if the 1990s had happened differently. In simultaneously depicting everyday life in Belgrade as abnormal and everyday life in the eu as ideal, abnormalcy discourse expresses how participants understand and define their place in the contested space of Europe. Having grown up in the shadow of the 1990s, this position is marked by a sense of tension between European belonging and exclusion, between a version of life that Belgrade youth see themselves as deserving, and the legacy of the 1990s that prevents them from achieving it. Class position was another important avenue through which participants expressed European belonging, particularly through their status as university students. However, for lack of space this article has been condensed to focus on youth and urbanity. She is exaggerating. The Serbian language has a flair for the dramatic. Lilly Drogerie was actually founded in Serbia in the 1950s, but after the 1990s was privatized and re-opened as a western-style cosmetic franchise and pharmacy in 2003. Three out of seventeen were born elsewhere in Serbia and came to Belgrade for university studies. Of those three, two self-identify as urban. Fora is a slang word with no direct English translation. It means trick, catch, pun, gag, joke, etc. 1996 The Yugoslav Drama. Quebec City: McGill-Queen’s University Press. 2007 Democracy in the Post-Communist World: An Unending Quest? East European Politics and Societies 21(1):7–30. 2002 American Kitchens, Luxury Bathrooms, and the Search for a ‘Normal’ Life in Postsocialist Hungary. Ethnos: Journal of Anthropology 67(3):369–400. 2003 ‘We Just Want to Live Normally’: Intersecting Discourses of Public, Private, Poland, and the West. Journal of the Society for the Anthropology of Europe, 3(1):2–13. 2008 Making Market Democracies? The Contingent Loyalties of Post-Privatization Elites in Azerbaijan, Georgia and Serbia. Review of International Political Economy 15(5):740–769. 2010 ‘There’s Nothing Anyone Can Do About It’: Participation, Apathy, and ‘Successful’ Democratic Transition in Postsocialist Serbia. Slavic Review 69(1):41–64. 2011 On the Road to Normal: Negotiating Agency and State Sovereignty in Postsocialist Serbia. American Anthropologist 113(1):88–100. 2005 Who’s Afraid of White Socks? Towards a Critical Understanding of Post-Yugoslav Urban Self-perceptions. Ethnologia Balkanica 9(4):151–167. 2009 After the Red Passport: Towards an Anthropology of the Everyday Geopolitics of Entrapment in the EU’s ‘Immediate Outside.’ Journal of the Royal Anthropological Institute 15:815–832. 2003 Between Europe and the Balkans: Mapping Slovenia and Croatia’s ‘Return to Europe’ in the 1990s. Dialectical Anthropology 27(3/4):313–329. 2007 Traumatic Memory in Generational Perspective: Memorizing Communism. Sociální Studia 1(2):79–95. 2009 Fake, Partial and Imposed Compliance: The Limits of the EU’s Normative Power in the Western Balkans. Journal of European Public Policy 16(7):1065–1084. 2012 Euroscepticism Amongst Youth in Serbia and Croatia as an Extreme Form of Strategic Coalition. Paper presented at the Second Euroacademia Global Conference: Europe Inside-Out: Europe and Europeaness Exposed to Plural Observers in Paris, France, April 27–28. 1996 Nationalism and the ‘Idiocy’ of the Countryside: The Case of Serbia. Ethnic and Racial Studies 19(1):70–87. 2009 Creeping EU Membership in South- East Europe: The Dynamics of EU Rule Transfer to the Western Balkans. European Integration 31(4):449–465. 1979 Orientalism. New York: Vintage. 2011 Youth Culture and Fading Memories of War in Hanoi, Vietnam. In Everyday Life in Southeast Asia. K. M. Adams and K. Gillogly, eds. Pp. 127–136. Bloomington: Indiana University Press. 2009 (The End of) Communism as a Generational History: Some Thoughts on Czechoslovakia and Poland. Contemporary European History 18(3):303–329. 1983 Urban Research in Yugoslavia: Regional Variation in Urbanization. In Urban Life in Mediterranean Europe. Michael Kenny and David Kertzer, eds. Pp. 76–108. Urbana: University of Illinois Press. 2006 Between Europhilia and Europhobia: Party and Popular Attitudes Towards Membership of the European Union in Serbia and Croatia. Perspectives on European Politics and Society 7(3):312–235. 2011 Europe is a State of Mind: Identity and Europeanization in the Balkans. International Studies Quarterly 55(2):309–330. 2009 Are the European Union’s New Boundaries Like the Iron Curtain? 1989, Borders and Freedom of Movement in Poland and Ukraine. International Journal of Politics, Culture, and Society 22(3):385–400. 1997 Imagining the Balkans. Oxford: Oxford University Press. 1992 Zagreb – Amsterdam – New York. Cross Currents 11(1):248–256. 2005 Europe Undivided: Democracy, Leverage and Integration after Communism. Oxford: Oxford University Press. 2007 Post-socialist Borderland: Promoting or Challenging the Enlarged European Union? Geografiska Annaler Series B, Human Geography 83(3):141–151. 1994 Inventing Eastern Europe: The Map of Civilization on the Mind of the Enlightenment. Stanford, CA: Stanford University Press.